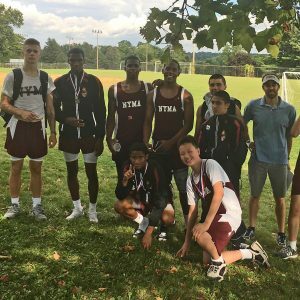 On 9/22 the Knights hit the ground running as they traveled to Oakwood Friends Academy for their second meet of the season. However, this was a much larger event as there were 10 different schools and over 100 runners on the trail. That didn’t stop our Knights as Matthew Montes and Karif Isaacs were able to finish in 7th and 8th place respectively and took home medals! Joshua Antoine finished just outside the top-10 in 12th place and Zaahir Woody finished 19th overall. Other runners who placed included Zamere McKenzie finishing 30th, Mickey Urso 33rd, and eighth-grader Michael Zellenger 44th. Another eighth-grader Daniel Geng had a personal best time at this event and placed 88th. The Knights overall team effort earned them second place for the second straight meet.